"The biggest surprise for strangers, says the Captain, is learning that all officers and soldiers on horseback have served in Afghanistan within the last 12 months, or are about to go." 27 Apr 11Two members of the Household Cavalry Mounted Regiment, each with his part to play in the ceremonial events planned for London this Friday, talk to Lorraine McBride about their preparations and hopes for the big day. Lance Corporal of Horse (LCoH) Dan Ridge will be one of 200 immaculately attired riders, trotting behind the royal coach. "The Army matches horses to riders in terms of build, weight, height and natural ability," he says. "We get London to ourselves, and, over each rehearsal, it builds up, drawing in more and more guys." War in Afghanistan News reports provided by ISAF Joint Command. Operations are reported in the following provinces: Badghis, Helmand, Uruzgan, Kandahar. In Murghab district, Badghis province, several Taliban insurgents were helped to a meeting with their 72 or so virgins, courtesy of a combined Afghan and coalition security force. The good guys also rounded up several more during clearing operations. Africom's First Commander Retiring After 40-year Career: "There is no greater honor,"
FORT MYER, Va., April 27, 2011 - Army Gen. William E. "Kip" Ward reviewed and saluted the troops for the last time yesterday on Summerall Field parade ground here as he retired from a career that spanned four decades and culminated in his service as the first commander of U.S. Africa Command. 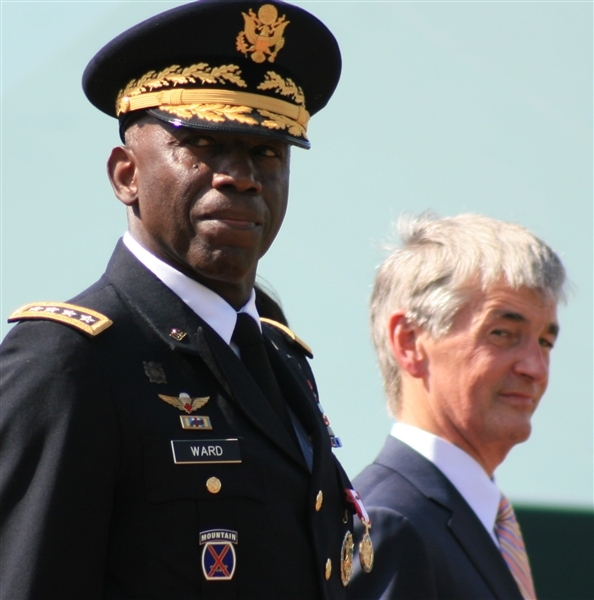 "This has been an experience for Kip Ward," the general said. "I would not trade it for anything. I leave this position proudly, honorably, humbly." Africom stood up its headquarters in Stuttgart, Germany, in October 2007. Army Secretary John M. McHugh reflected on Ward's career. Cpl. Adam D. Jones, 29, of Germantown, Ohio, died April 27 while conducting combat operations in Helmand province, Afghanistan. He was assigned to 3rd Battalion, 2nd Marine Division, II Marine Expeditionary Force, Camp Lejeune, N.C.
LANDSTUHL, Germany, April 27, 2011 – The top trauma surgeon who oversees the care of the most severely wounded warriors at Landstuhl Regional Medical Center here soon will take his experience and expertise to train other Air Force medical personnel in trauma care at the Baltimore Shock Trauma Center. Air Force Lt. Col. (Dr.) Raymond Fang, director of trauma at Landstuhl for the past seven years, will serve as director of the Air Force’s Center for the Sustainment of Trauma and Readiness Skills program –- known as “C-STARS” -– which is affiliated with the University of Maryland School of Medicine and Medical Center. British troops based in the Afghan capital Kabul have spent some of their Easter weekend at a local school, giving out notebooks and pens to the pupils. Men and women from the Kabul Joint Support Unit at Camp Souter met the children at the nearby Qabel Bai school on Saturday 23rd April. The school provides lessons for over 5,000 (FIVE THOUSAND) local children, running more than 40 classes per day. Up to 50 children attend each 2-hour class, starting at 06:30am and finishing at 5:30pm. WASHINGTON, April 27, 2011 – Enemy fighters are beginning to make their annual spring resurgence in Afghanistan, but are resurfacing as a weakened force with less support from local residents, a U.S. military commander said today. Marine Corps Maj. Gen. Richard P. Mills spoke with journalists at the State Department’s Foreign Press Center here, along with Derek Hogan, senior advisor to the State Department’s special representative to Afghanistan and Pakistan. Mills returned to the United States three week ago at the end of his command of the International Security Assistance Force's Regional Command Southwest in Afghanistan’s Helmand and Nimruz provinces. KINSHASA, Democratic Republic of the Congo (4/26/11) - A two week medical exercise, in partnership with the Armed Forces of the Democratic Republic of the Congo and U.S. Air Forces Africa, focusing on aeromedical evacuation, kicked off here at the Centre Superior Militaire Academy Monday. MEDLITE 11 is an exercise that will improve the readiness of both countries' medical personnel and will consist of classroom instruction, an aeromedical evacuation training scenario and is scheduled to conclude with a mass casualty exercise, May 4th. "Our months of planning are now culminating in this mission and exercise as we build on lessons learned from MEDFLAG 2010," said Air Force Lt. Col. June Oldman, mission director for MEDLITE 11 and a member of the 137th Aeromedical Evacuation Squadron, Oklahoma Air National Guard. WASHINGTON, April 27, 2011 - The operations of the past year highlight the need for the United States to maintain responsive and flexible global forces, Navy Secretary Ray Mabus said at a Defense Writers Group breakfast here today. Mabus said he had just returned from Japan, where he met with 7,000 sailors and Marines who worked in Operation Tomadachi to provide relief for earthquake and tsunami victims. "A couple of things struck me: One of them was the amazing skill of these men and women in uniform, and secondly was the flexibility that they showed," he said. SAN DIEGO (NNS) -- Sailors and Marines are learning new ways to fight off the stresses of military life at the 2011 Navy and Marine Corps Combat Operational Stress Control (COSC) Conference in San Diego, April 26-29. The theme of this year's conference highlights "the critical role of junior leaders" and how their actions are vital in stress management. "Operational stress increasingly affects our personnel; the stakes are high," said Vice Chief of Naval Operations Adm. Jonathan W. Greenert, one of the conference keynote speakers. "Operational stress control is the foundation for combating that stress, therefore this conference is important. We, as leaders, are charged with the well-being of our Sailors, Marines and their families. "The collective goal is to build an environment where our people have the skills, support network, and if necessary, the clinical health care to deal with psychological challenges—and succeed," added Greenert. In Afghanistan, the head of a prison where some 500 inmates, mostly Taliban militants, carried out a daring escape earlier this week, has been arrested. Afghan troops recaptured 71 of the 488 inmates who fled from Sarposa prison in southern Kandahar province on Sunday through a 300-meter-long tunnel. LANDSTUHL, Germany, April 27, 2011 – The pace never slows at Landstuhl Regional Medical Center here, the largest U.S. military medical facility outside the United States and the first stop for wounded troops evacuated from the war zones. More than 61,000 U.S. and coalition service members, civilian employees and contractors have been flown here since January 2004, public affairs officer Chuck Roberts reported. And with operations beginning to escalate in Afghanistan as spring sets in, the pace sees no sign of letting up. PAKTYA PROVINCE, Afghanistan – U.S. and Afghan forces handed out hundreds of coats to people living in the rural village of Charwazi, Afghanistan, April 19. All told, Afghan National Army and 1st Platoon, C Company, 1st Battalion, 168th Infantry Regiment, 2nd Brigade, 34th Infantry Division, Task Force Lethal distributed roughly 6,000 coats to remote Aghan villages since the drive began last year“The coats help because many of the homes only have small wood stoves,” said an ANA soldier who helped pass out the coats. A delegation from Turkey is urging Syria to quickly start reforms amid a military crackdown on demonstrations against the government of President Bashar al-Assad. The Turkish mission comes after at least 228 members of Syria's ruling Baath Party resigned Wednesday in protest of Mr. Assad's use of deadly force against pro-democracy demonstrators. There are reports of Syrian tanks headed into the northern port of Latakia on Thursday, a scene of recent protests, where security forces reportedly fired on demonstrators. The crackdown also continued in the southern town of Daraa which has been under siege from troops and tanks, keeping most people off the streets. There is a strong military presence in other Syrian towns, including two suburbs of Damascus. WASHINGTON, April 26, 2011 – NATO has gained momentum in the last few days in Libya, British Defense Secretary Liam Fox said at the Pentagon today. At a news conference, Fox thanked the United States for adding Predator drones to the skies over Libya. ARLINGTON, Va., April 26, 2011 – About 900 National Guard members are responding to floods, fires, tornadoes, and other emergency situations in six states. Guard members are responding or staging personnel in response to weather reports that forecast more rain in already flooded areas of North Dakota, Missouri, Indiana, as well as tornadoes in Arkansas and ongoing wildfires in Texas. Operations in Minnesota are wrapping up. In North Dakota, more than 350 Guard members are patrolling levees to monitor possible breaches, manning traffic control points and serving as quick-reaction forces, providing more than 18,000 sandbags to reinforce levees, according to North Dakota National Guard reports. WASHINGTON, April 26, 2011 – Nearly 2,000 helping professionals from around the world are gathering in Chicago this week to share the latest family-related information and research and to hear from some of the nation’s most renowned military family experts. The 2011 Family Resilience Conference offers participants access to more than 200 workshops, computer labs and roundtables on everything from psychological health and well-being to education and spouse employment. SHARAN, Afghanistan, April 26, 2011 – “Safe haven” took on new meaning yesterday as hundreds of Afghans gathered to open an orphanage here in Paktika province’s capital. The U.S. military contributed funding and construction oversight for the orphanage, which includes three classrooms and will house and educate up to 100 orphan boys. WASHINGTON, April 26, 2011 – For Zelma Owens -- then a uniformed officer with the Defense Protective Service -- the Sept. 11, 2001, terrorist attack on the Pentagon set in motion a career path that has led to her current position as an antiterrorism officer with the Pentagon Force Protection Agency. For Owens, the attack began a long series of days with little rest as she helped to secure the site, establish a force protection perimeter and manage the massive influx of investigators, rescuers and others involved with the recovery effort. Pfc. Anthony T. Kaho’ohanohano and Pfc. Henry Svehla will be inducted into the Pentagon’s Hall of Heroes on May 3 at 2 p.m. EDT. Deputy Secretary of Defense William J. Lynn III, Under Secretary of the Army Joseph Westphal, Army Chief of Staff Gen. Martin E. Dempsey and both soldiers’ families will participate in the ceremony. President Barack Obama is expected to present the Medal of Honor to the families of Kaho’ohanohano and Svehla at a ceremony at the White House on May 2, 2011. On April 13 the White House announced the soldiers will be posthumously awarded the nation’s highest military honor for their heroic actions during the Korean War. LOGAR, Afghanistan (April 27, 2011) – With night optics mounted and cumbersome rucksacks upon their backs, soldiers lined the troop compartment of a CH-47 Chinook helicopter as they prepared to air assault into Baraki Barak District, Afghanistan, April 17. The Chinook dived toward the landing zone as soldiers began to stand in preparation for their six-day mission. Baraki Barak District Sub-Gov. Mohammad Rahim Amin conducts a public shura in the southern region of his district April 18. Amin conducted multiple shuras while coalition and Afghan forces secured villages and searched areas of interest, respectively, during the six-day Operation Baraki Bahar. Two-by-two the men exited the aft of the aircraft into the soft marsh-like farmland. Soldiers silently assembled into their squads and moved toward the first objective of their clearing operation throughout the district. More drugs off the streets as Afghan National Security and International Security Assistance Forces discovered 2,502 pounds (1,135 kilograms) of hashish during a patrol in Zharay district, Kandahar province, today. The drugs were destroyed by security forces. 26 Apr 11 British Officer Cadets taking part in this year's Sandhurst Cup in America have won the top two best international team positions. The British Cadets also won the Navigational Streamer, presented to the overall winner of the land navigation section of the two day challenge. Fifty teams took part in the annual inter-company military skills competition at the United States Military Academy West Point, including seven international guest teams from Canada, Australia, Afghanistan, Taiwan, Chile and two Royal Military Academy Sandhurst teams. The two day competition combined a six minute team marksmanship challenge, as well as a four and a half hour combat assault challenge including obstacle courses, command tasks, mental and physical endurance challenges such as a rope ravine crossing and casualty carries, a 90 minute navigation course followed by a river boat crossing and a first aid casualty assessment, before finishing with a series of mental military challenges. By Kris Osborn WASHINGTON (Army News Service, April 26, 2011) -- The Army National Guard is preparing to receive the first light utility helicopter equipped with a new, state-of-the-art mission equipment package. The new mission equipment package, or MEP, aboard the UH-72A Lakota light utility helicopter includes an electro-optical/infrared sensor, enhanced cockpit screens, high power illuminator system, analog-digital data downlink capability and GPS-enhanced moving map displays. 27 Apr 11 The UK Defence Secretary, Dr Liam Fox, and Chief of the Defence Staff, General Sir David Richards, have met with their American counterparts in Washington to discuss current operations including Libya and Afghanistan. Dr Fox and General Richards met with US Defence Secretary, Robert Gates and Chairman of Joint Chiefs of Staff, Admiral Mike Mullen, to make an assessment of various operational missions and to discuss the possibility of exploiting the emerging opportunities on the ground. Lance Cpl. Joe M. Jackson, 22, of White Swan, Wash., died April 24 while conducting combat operations in Helmand province, Afghanistan. He was assigned to 1st Battalion, 5th Marine Regiment, 1st Marine Division, I Marine Expeditionary Force, Camp Pendleton, Calif.
27 April 2011 VOA News At least 13 people were killed Wednesday in clashes between security forces and protesters in Yemen where anti-government activists rallied against a political transition agreement. Yemeni medical sources say 10 of the deaths were in the capital, Sana'a. In the country's south, in Aden, two Yemeni soldiers and a protester were killed in a gunfight as security forces tried to break up a demonstration. Protesters were demanding the immediate removal of President Ali Abdullah Saleh. They also took to the streets in other cities in spite of a deal brokered by neighboring Gulf Arab states that calls for Mr. Saleh to step down from power. 27 April 2011 VOA News A U.S.-based security organization says North Korea is making progress on what Pyongyang says is a light water reactor that has raised new international concerns about the secretive North's nuclear weapons program. The Institute for Science and International Security (ISIS) on Wednesday released satellite images showing construction activity at the Yongbyon nuclear complex — the North Korean site where two U.S. scientists were shown a sophisticated uranium processing facility last year. The ISIS images, taken commercially March 8, show a construction crane and what appears to be building material along with what analysts say is a 21-meter cylinder whose exact use was not clear. 04.27.2011 Story by Staff Sgt. Michael Longoria AL ASAD AIR BASE, Iraq -- When a runway closed in Turkey, officials scrambled to find another way to get supplies to U.S. forces in Iraq. The answer was quite simple; the Federal Aviation Administration approved flight line at Al Asad Air Base, Iraq, which is the only place in country that can land civilian U.S.-flagged aircraft. 27 April 2011 VOA News Israel's prime minister says he has instructed his security forces to continue to enforce a naval blockade on the Hamas-ruled Gaza Strip, as activists prepare to send another flotilla to the region. Prime Minister Benjamin Netanyahu said Wednesday that he is also pursuing diplomatic efforts to prevent the flotilla from setting sail from Turkey as early as May. Activists are hoping to deliver supplies directly to Palestinians in Gaza, in defiance of an Israeli blockade. Mr. Netanyahu has expressed concern that the ships could deliver weapons to militants. 27 April 2011 VOA News A video released on jihadist websites shows four French hostages kidnapped by a North African al-Qaida group last September. The U.S.-based SITE intelligence group says the video was posted on Tuesday. It shows photos of the hostages with armed militants standing behind them. FORWARD OPERATING BASE SHARANA, Afghanistan, April 27, 2011 - To the strains of "Amazing Grace," hundreds of Task Force Currahee soldiers slowly filed into a warehouse-like multipurpose room here yesterday. At the front of the room, facing rows of simple folding chairs, were the upright rifle, boots, helmet, dog tags and photograph of a man they will never see again. The 101st Airborne Division's "Currahee" 4th Brigade Combat Team from Fort Campbell, Ky., gathered to pay tribute to the 16th of its own to die since the brigade deployed to Afghanistan's Paktika province last summer: Army Sgt. John Paul Castro, a 25-year old husband and father of two, who was killed April 22 when his unit was attacked by enemy small-arms fire. Castro's battalion commander, Army Maj. Justin Reese, spoke of the soldier who had been assigned to "Dealer Company," 1st Battalion, 506th Infantry Regiment, for his entire seven-year career, deploying once to Iraq and twice to Afghanistan. Castro's last mission was "a fight that occurred at distances measured in hand-grenade range, within a complex environment of walled mazes and collapsed structures during the hours of darkness," Reese said. "It was within this context -- closing with and destroying a determined enemy force -- that Sergeant Castro gave his life." 04.26.2011 By Lance Cpl. Timothy L. Solano TOUBAKOUTA, Senegal - The sun rises early here as the Marines of second platoon, Ground Combat Element, Security Cooperation Task Force, Africa Partnership Station 2011, form in a line, water bottle in hand. Though the daily ritual may seem monotonous to some, taking medication in malaria endemic areas could make all the difference in living with or without a potentially terminal disease. In malaria endemic areas, prevention is paramount to unit effectiveness, especially with a mission like APS-11’s. In the partnered military-to-military exchange, the 45-man platoon would be stretched thin in supporting the extensive exchange package, should a malaria casualty occur. 27 April 2011 VOA News An international aid ship has docked in Libya's rebel-held port of Misrata after NATO airstrikes helped stop a bombardment of the area by pro-government forces. The International Organization for Migration says relief workers began rescuing refugees from the besieged western port and unloading humanitarian aid after the ship pulled into Misrata on Wednesday. Intense shelling by forces loyal to Libyan leader Moammar Gadhafi delayed the ship's docking on Tuesday. At least three migrant workers were reported killed and up to 20 wounded in the assault. 27 April 2011 VOA News Officials in Pakistan say Afghan and Pakistani security forces have exchanged gunfire across the porous border in the northwestern part of the country. Wednesday's skirmish between border guards occurred in Pakistan's South Waziristan tribal region and reportedly killed at least one Pakistani. The country's army did not immediately comment on the incident. According to a Pakistani government official, the clash erupted after Afghan forces fired a mortar into Pakistan. Afghan and Pakistani forces based along the border occasionally fire at each other, but the violence rarely escalates beyond isolated incidents. The clashes sometimes involve security forces from Afghanistan pursuing Taliban insurgents who cross the border into neighboring Pakistan. 04.26.2011 Story by Staff Sgt. Ashlee Lolkus PARWAN PROVINCE, Afghanistan – Soldiers of 1st Squadron, 113th Cavalry Regiment, Task Force Redhorse, 2nd Brigade Combat Team, 34th Infantry Division, TF Red Bulls, mourned the loss of a friend and fellow soldier during a memorial ceremony held at Joint Combat Outpost Pul-e Sayad, Afghanistan, April 25. Soldiers awaiting for the ceremony to begin watched as two OH-58 Kiowa helicopters flew overhead, circling the small JCOP. Pilots of TF Phoenix, 10th Combat Aviation Brigade, held out American flags showing their respect to the men and women of TF Redhorse as thanks for support received only days prior. U.S. Army Staff Sgt. James A. Justice, an infantryman from Grimes, Iowa, was killed in action while he and his platoon responded to a downed aircraft April 23 in Alah Say District, Kapisa province, eastern Afghanistan. Officials say an Afghan military pilot has opened fire on foreign troops in Kabul, killing eight coalition service members and a contractor, in the deadliest such incident since the war began in 2001. The Afghan Defense Ministry said the veteran pilot shot and killed coalition troops during an argument Wednesday inside an Afghan air force facility at the Kabul airport. The pilot was killed in subsequent gunfire. 26 April 2011 VOA News Michael Onyiego | Nairobi With its mandate set to expire in less than four months, the Somali government has decided to postpone national elections until 2012. On August 20, the original mandate bestowed to Somalia's transitional government by the international community will run out. The besieged government was given seven years to deliver a new constitution and national elections, but has thus far failed on both counts. After a recent meeting, however, Somalia's Council of Ministers have announced it will deliver both by next year. Speaking to VOA, senior advisor to the Prime Minister Abdirahman Omar Osman said holding elections this year would be futile given the threat posed by Islamic insurgents al-Shabab. "Most of south and central regions are controlled by al-Shabab who are not willing to take part of the said election," said Osman. "Therefore, it would be very difficult to get a kind of representative members of parliament that is accountable to its people."